Puzzle is a small Bay Area business creating natural, affordable makeup for all women. The beauty industry is saturated with over-priced, synthetic products, and images of high-gloss models. It can portray a beauty standard that is alienating and intimidating. Avital Elgaziel has dedicated her career as a stylist and salon owner to making every person who visits her Walnut Creek location feel beautiful. She believes that feeling confident should come easy, and makeup should be affordable. When she wanted to launch a line of natural, high-quality, customized makeup products and spread that philosophy to a wider audience, First Person jumped at the chance to help introduce a brand whose core goals we believed in. We established a brand platform that conveys the ideals Avital wanted to achieve, and how the company would differentiate itself in the market. We defined those attributes through brand messaging, as well as establishing photography styles, and initial marketing imagery. 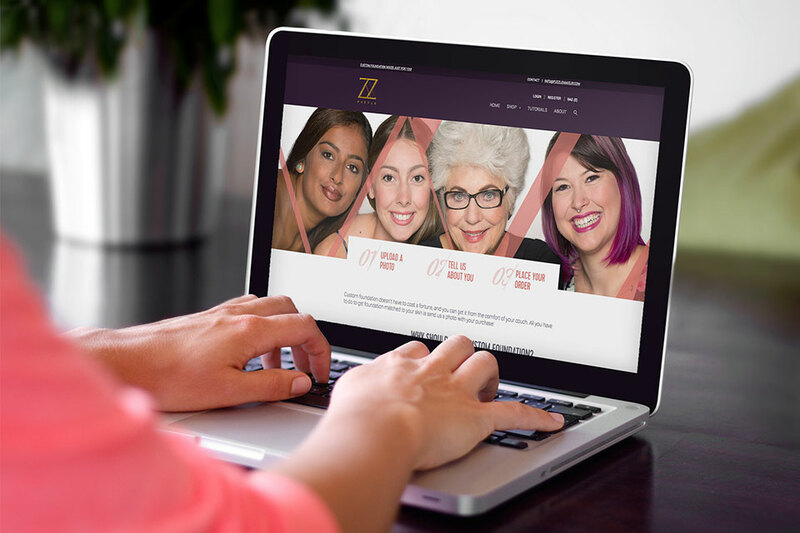 We also created a beautiful, custom website that conveys those ideals, and allows women to find makeup perfect for them. Over 1,700 different makeup combinations were created so customers can easily find the best combinations of eyeshadows, lipsticks, blushes for their specific features. With a robust site that Avital can maintain herself, she has the platform she needs for her business to grow. not overly youthful, girly, or high-fashion. With a goal of reaching make-up wearers of all ages, ethnicities, even genders, the brand needed to feel approachable. We went with a pallet of royal purple, with accents of coral, teal and gold. For the website we did extensive research on competing brands, both large and small companies, as well as looked for other sites that allowed you to order custom foundation. We planned our customer journey, and created our site architecture around our two most important goals: to provide custom makeup combinations for day and night looks based on a customer’s physical features, as well as allow a customer to order custom-mixed foundation by uploading a photo of themselves for color-matching. I helped direct a junior UX designer through user journeys, site architecture, and wireframes. I worked with two other members of my team to create logos, refining the brand. I also art directed a junior designer to help create assets for the site. Working with two photographers, we both worked on enhancing photography for the site, using the logo as a design accent, and prepping product shots. I was also personally responsible for all of the website copy, including working specific brand messaging in, but also maintaining a clear voice throughout the site. site we chose Shopify because it was the best at handling our e-commerce needs. We customized an existing template drastically, as well established custom data combinations on the backend. We created custom forms for both ordering custom color foundation by uploading a photo, as well as getting makeup combinations. I was in charge of managing and working with the development team.